Are you looking for a unique gift for family, friends, neighbors, or teachers? 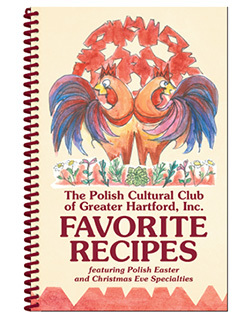 The Polish Cultural Club of Greater Hartford, Inc. is proud to offer a treasured collection of recipes shared by Club members and friends. Newly published, it contains 300 recipes, including Appetizers & Condiments; Soups & Salads; Vegetables & Side Dishes; Main Dishes; Breads, Rolls & Muffins; and Desserts. Also included are traditional Easter (Wielkanoc) and Christmas Eve (Wigilia) favorites, as well as 16 bonus pages of helpful cooking hints. At only $16.00, "Favorite Recipes" makes an Ideal Gift for the Holidays! Please print and fill out the form below to order.